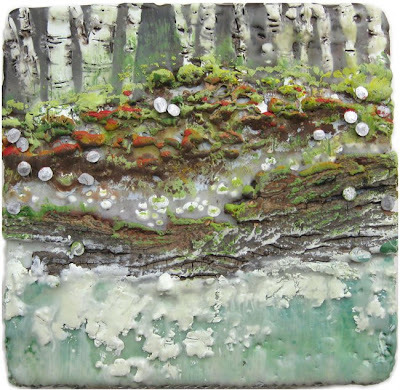 Last night we celebrated the opening of "Luminous Landscape", a new exhibition featuring encaustic paintings by Linda Cordner, Charyl Weissbach, Janet Bartlett Goodman and Tracy Spadafora. 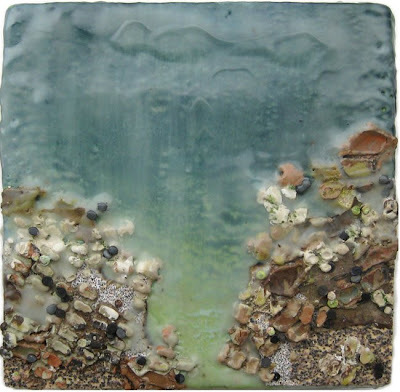 The artists in this show have employed diverse encaustic-based means for exploring the subtle and mesmerizing affinity imparted by our surroundings. The use of pigmented wax, with its vivid color and translucent properties is uniquely able to convey nature's vastness and its mysterious allure, creating an illusion of timelessness. 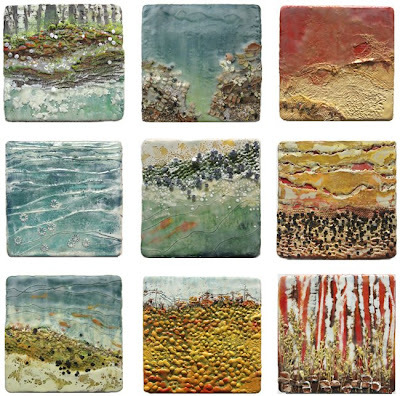 Linda Cordner has exhibited at Three Graces on multiple occasions, in the Teeny Tiny Art Shows and most recently in "Making Their Marks in Molten Wax. 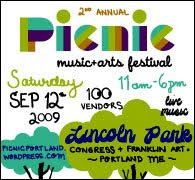 Linda was raised in Connecticut and received a Bachelors of Fine Arts from the University of Connecticut with concentrations in Graphic Design and Painting. She also spent a semester studying in London. An early interest in art lead her to choose this path without hesitation. After college she settled in Boston and has explored many areas of art and design throughout her career. "I am very drawn to wax and its tactile qualities, the smell and viscosity of the medium are very different from other painting techniques. Creating organic forms is a natural extension of wax's origin. Coming from a background in graphic design, I am drawn to certain color schemes and shapes, the repetition and placement being important to the composition. My paintings are made by layering multiple coats of wax which can completely obscure the under layers at times. 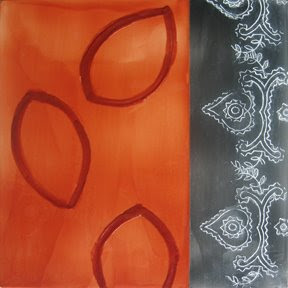 I use collage or incised patterns and lines to show the translucency of the wax." 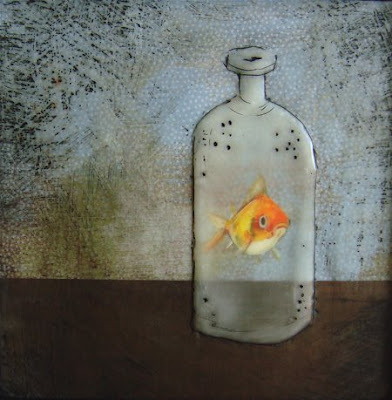 Janet Bartlett Goodman currently resides in Oakland, California. 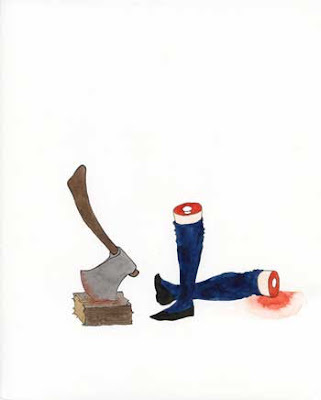 A native of Boston, Janet received her BFA from Massachusetts College of Art, with a major in Industrial Design. Her early work as a Product Designer honed her eye for color, line and form. "My father was an Artist. So the smell of linseed oil and turpentine always floods me with memories of my childhood. The work that I am doing is about people and places that are important to me. The power of imagery to evoke emotions and create memories has always fascinated me. I use color, line, and depth to create a lyrical aesthetic. 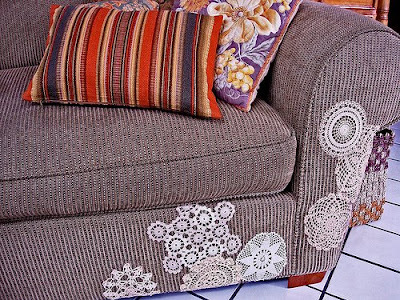 Each piece holds a single moment in time. In some of the works the viewer is invited to wander in. With the grid pieces, the viewer sits firmly outside the scene, and the image is allowed to stand-alone. My background is in product design so, for me, material and processes are very important. Wax is a wonderful medium to work with and I love the challenges that come from working in this very ancient technique. 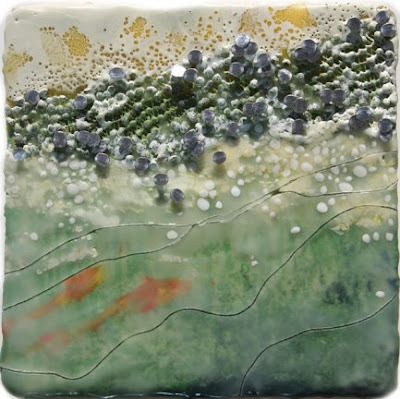 Encaustic is a mixture of bees wax, demar resin and pigment which is heated and applied to a substrate than reheated and each layer is fused to the one below. Once fused you get a very rich, deep, luminous surface. The process of making art should not be routine; it should make you continually question and experiment. Each piece should build on the success and failures of the last." Tracy Spadafora works and lives in Boston. 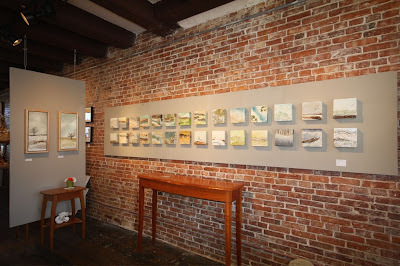 She is exhibiting paintings from her "Persistance of Nature" Series. 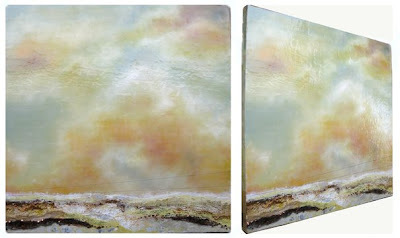 Tracy is exhibiting paintings from her "Persistance of Nature" Series. "Images of nature came into my work many years ago. Intrigued by the elegant and complex patterns of leaves and other flora, I began incorporating them in my work as symbols of our natural environment. 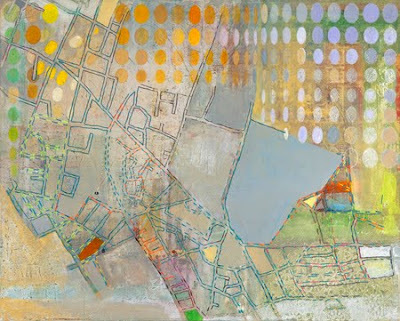 In my paintings these organic forms are juxtaposed with symbols of our man-made environment, represented by schematic diagrams and architecture plans of the "Big Dig" artery project in Boston, MA. 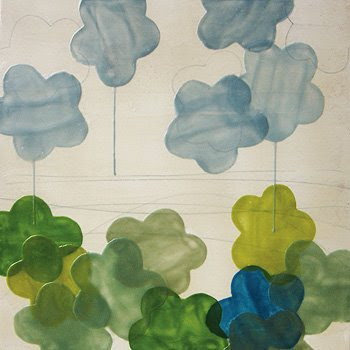 The leaves, pods, flowers and seeds often take on a whimsical quality as they hang, float, and blossom from a background of roads, parking lots, and industrial parks, ultimately reshaping these structured surroundings. 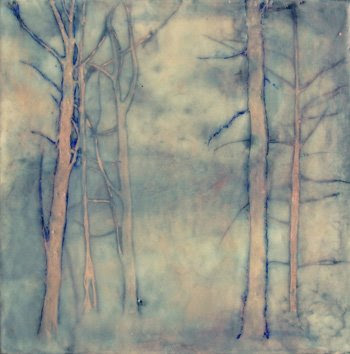 I work with an ancient wax painting technique called encaustic, which allows me to layer images and preserve them underneath the surface. The obscuring and burying of images within the layers of wax and paint helps to extend their meaning into the realms of memory and intuition. In these works natural structures and man-made structures converge and collide, creating a dialogue between these opposing forces. The natural environment has suffered greatly as a result of commercial, residential, and industrial development. Nature struggles to survive and find new life within the continuous sprawl of these man-made environments. With these paintings I intend to convey a sense of the poetry and endurance of nature as a force - a force that seems to persist in spite of man's actions. In this work I seek to address larger questions concerning the lineage of our natural and man-made environments." 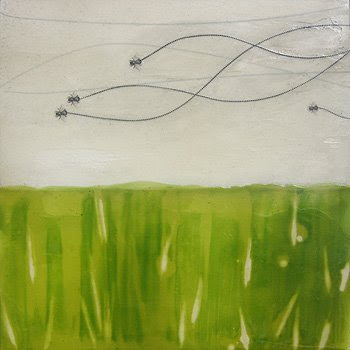 Charyl Weissbach is a Boston encaustic painter. 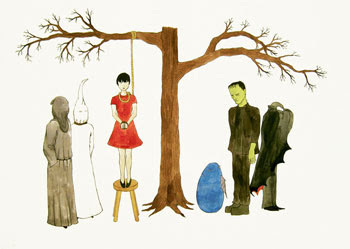 She has a BFA in Painting and Art History from the Massachusetts College of Art. 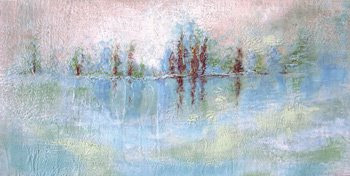 Her painting technique involves the use of hot wax(encaustic)in combination with oil paints. "Color, texture, and light placed within familiar settings such as a landscape or seascape can evoke feelings of inspiration. These locations contain intriguing compositions, color rich in texture, and unusual shapes that, in collaboration, emit an aesthetic sensation of harmony, and the illusion of timelessness. The imagery of my work does not accurately represent nature, as we know it. With this, I am able to convey nature's vastness and its mysterious allure, which is a significant theme in my compositions. Therefore, I try to unveil an abstraction of nature's character, attempting to capture some of its infinite variations of color, shape, and ethereal beauty.I derive great pleasure from satisfying a viewer's yearning for visualizing the complexity and beauty of our natural surroundings. 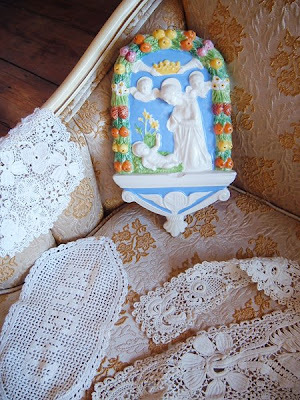 It is my hope that these feelings, which have formed the basis of these paintings, will be in some way conveyed to those viewing them." 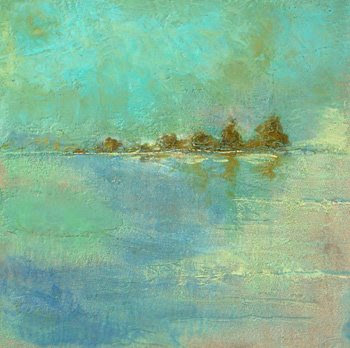 "Luminous Landscape" is on view thru August 31st. You can also view all of the paintings from this exhibition in our online shop! 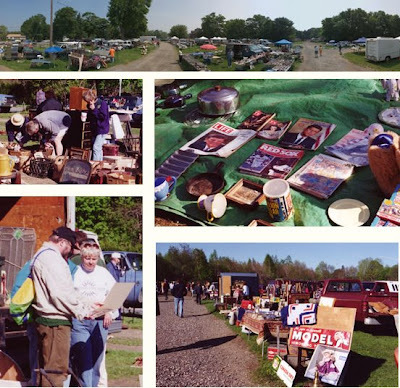 flea market finds + Amy Gross! 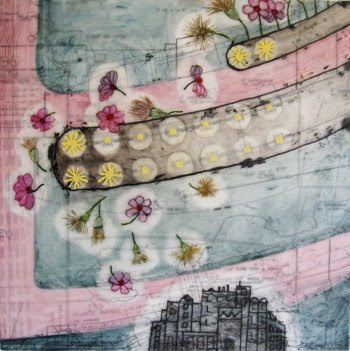 Amy is a brilliant artist and textile designer. 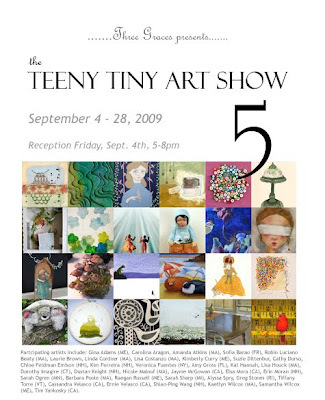 She is participating in the upcoming Teeny Tiny Art Show #5 in September! 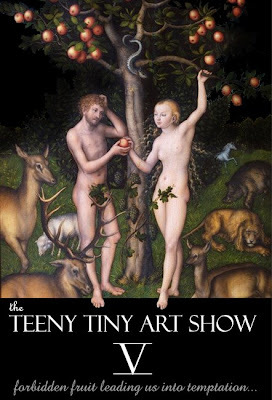 In fact, I just posted an interview with Amy to our Teeny Tiny Art Blog. You can read about Amy and some of the other participating artists HERE! AND I've created a special blog dedicated to this special show. In the coming weeks I will be posting about participating artists - interviews, pictures, random things...more than you would ever need to know!! Read all about 'em here. And here's Robin with the work! We have the most beautiful show in the gallery right now! 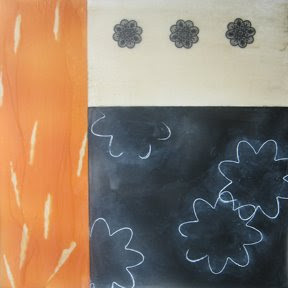 "Above and Beyond" is an exhibition of encaustic paintings by Robin Luciano Beaty. 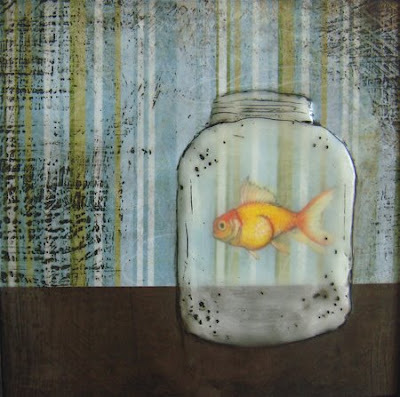 Robin Luciano Beaty is an award winning painter out of Newbury, Ma. 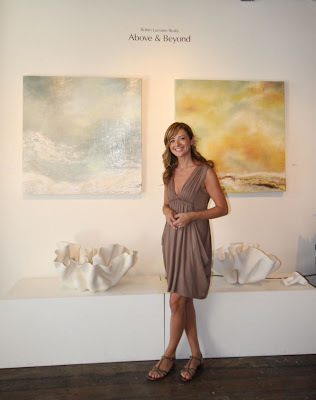 Her work has been featured in multiple solo exhibitions. 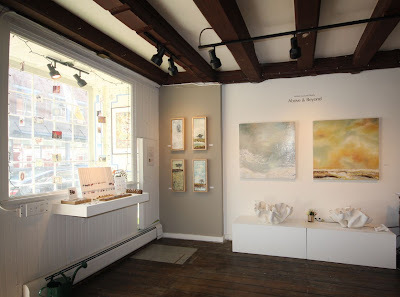 Represented in many private and corporate collections internationally, her work can also be found in galleries around New england and numerous group and juried shows. 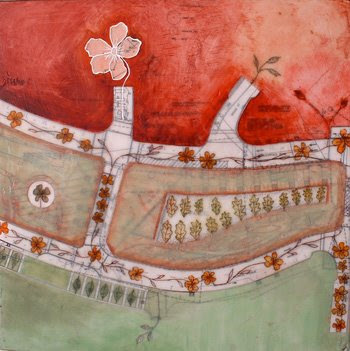 Most recently Robin was awarded the Award for Excellence in Mixed Media at the NAA's 12th annual Regional juried show as well as the prestigious International Encaustic Painting "Conference Award" for Best in Show in the exhibition juried by Nicholas Capasso, chief curator of the Decordova Museum. Robin's highly collected work has been described as "a compelling intersection between painting, sculpture and installation" and "beautifully conceptual, satisfying mind and spirit simultaneously". 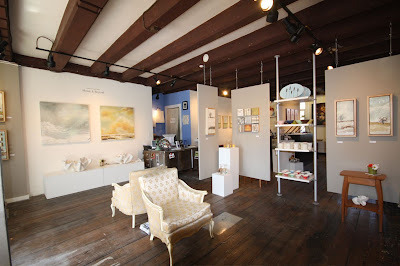 "Above and Beyond" is up thru August 3rd - don't miss it!! If you are too far to make the journey, you can see all of the works here and here in our online shop! Enjoy. 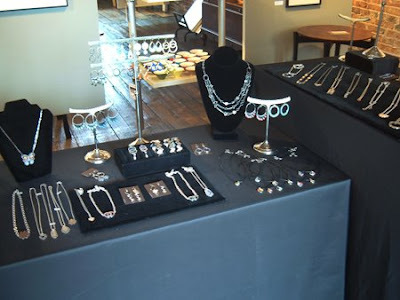 Also in June...Sara du Long was here in the gallery for a Trunk Show featuring lots of new pieces. She was working away all winter to create some amazing new designs...It was great for folks to have the opportunity to meet Sara in person, and hear her talk about her process and inspiration! 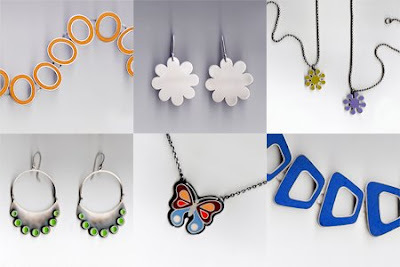 Though Sara is not here everyday to share her secrets, her fabulous jewelry designs are a permanent fixture. Check out some of the new work in our online shop! **We will be having a Trunk Show with Erin Moran in August - details coming soon! 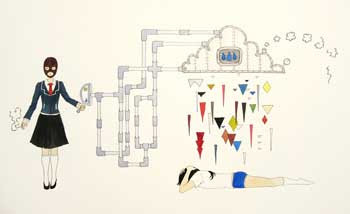 Three Graces featured "Love Letters to Kafka", an exhibition of recent works on paper by Nicole Maloof. The exhibition was extremely well received, it challenged many viewers and made others giddy with excitement! Nicole Maloof was born in 1983 in Seoul, South Korea. She received her BFA with a concentration in Painting and her BA with a concentration in Chemistry from Boston University in 2006. She currently resides in Boston, MA. In July, Nicole will be travelling to South Korea on a teaching Fulbright. For the next year, she will be teaching English, investigating Korea's contemporary arts, and continuing to make art as well. An account of the trip will be posted on her blog (http://nicolesyearofkimchi.blogspot.com). "Love Letters to Kafka" came down this past Monday. Many works from the show sold, however the remaining works will be available thru Three Graces. Check out our online shop for more details. Enjoy!